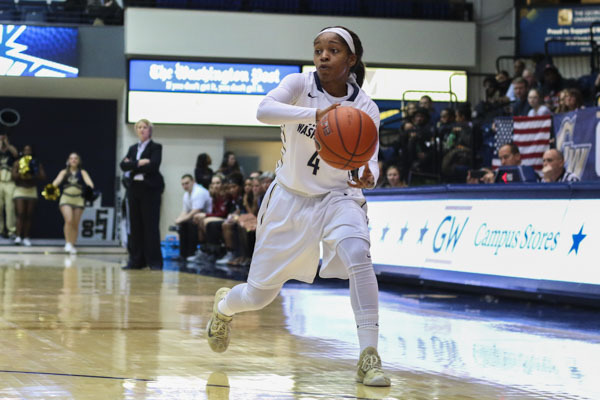 Graduate student Lauren Chase dribbles the ball in GW's game against UMass. Chase has been in the starting lineup for every game this season. Updated: Jan. 21, 2016 at 12:29 a.m. In the Colonials’ past four games, they have not stopped running. GW has controlled the pace and led in fast break points by a combined margin of 52–22. At the forefront of nearly all of their offensive attacks is graduate student point guard Lauren Chase. Chase is the leader of the team and the heartbeat for the Colonials on both sides of the court. She may not have the statistics to be an All-American or get drafted into the WNBA, but her impact could be the deciding factor in how far the Colonials can go in her final season. Chase’s high-energy play make GW’s fast-break points and high number of possessions possible. Fourth in the Atlantic 10 conference in assists, many of which come in transition leaving a teammate wide open, Chase is always pushing the ball up the court and forcing defenses to make decisions faster than they are comfortable with. Chase plays the same high-effort and high-activity style on defense. She usually matches up against the opposing team’s better guard and does not allow her any space with the ball. Her tenacity on defense tends to spread to the rest of her teammates when she is on the court. Against Iowa, Chase fouled out near the end of the game after playing 33 minutes of hard-nosed basketball. Once she was no longer on the floor, the intensity and confidence on the Colonials side of the floor was noticeably weaker. This consistency on both sides of the floor is a big factor in why Chase is almost always on the floor. She plays for a team-high 31.4 minutes per game and has been in every single staring lineup. The only other player on the Colonials who boasts similar numbers is senior forward Jonquel Jones. Chase and Jones are the leaders of the team, but their connection goes deeper. Before they transferred into GW from separate colleges, Jones from Clemson and Chase from UMBC, they played basketball together at Riverdale Baptist High School (MD) under current Colonials assistant coach Diane Richardson. In games, they each complement the other’s style. “JJ and I are really clicking and I attribute that to our relationship off the court. Everyone knows we are close off the court, but also on the court I can read what she is about to do and she knows what I’m about to do so we can feed off each other,” Chase said. In big games this season, Chase has stepped up and fueled the Colonials on their way to a win. In back-to-back matchups against Villanova and Iona, the games were coming down to the wire. Chase was able to combine for 11‒13 from the line allowing the Colonials ‒ who have struggled from the line this season (66 percent) ‒ to hold on for the victory. Most recently, Chase scored 8 points and added nine assists in GW’s 67-50 win over UMass on Wednesday. That came one game after she tallied 10 points and six assists against No. 25 Duquesne on Sunday with a team-high 55 percent from the field to give the Colonials another marquee win against the then-top ranked A-10 team. Chase has also been a top-of-the-line example for freshman point guard Mei-Lyn Bautista to play against every practice. As the season has progressed, it is clear that Bautista has become more comfortable handling the ball and has incorporated parts of Chase’s game into her own including pace of play and aggressiveness offensively. “I just want to influence Mei the best that I can, especially about being a point guard out there. It’s been fun because she is very receptive to everything,” Chase said. As a graduate student, Chase has been given one last shot. She is still eligible in her fifth year of college due to an elbow to the head in the spring of 2013 that caused a concussion, her third, bad enough for her to miss her entire junior season. Chase has bounced back from the devastating injury and become one of the best point guards in the A-10. This article appeared in the January 21, 2016 issue of the Hatchet.